Marcos Litche, a native of Venice, Italy and a traveling peddler, migrated to the Avoyelles Post c. 1794. Because of a broken wagon wheel, the pleasant environment, and friendliness of the Indians and local residents, he decided to stay in this area. He established a trading post and eventually became known as Marc Eliche'. He married Julie Carmouche, daughter of Joseph Carmouche and Madeline Ducote of Pointe Coupee' Parish on May 3, 1796. Eliche' obtained Spanish land grants totaling more than 400 arpents. The area became known as "Marc's Place", "Marc's Store", and finally "Marc's Ville", and was first officially noted on U.S. survey maps in 1809. Eliche' donated most of the present courthouse square. Location. 31° 7.652′ N, 92° 3.948′ W. Marker is in Marksville, Louisiana, in Avoyelles Parish. Marker is on North Main Street (State Highway 107/115) near East Ogden Street, on the right when traveling north. Touch for map. 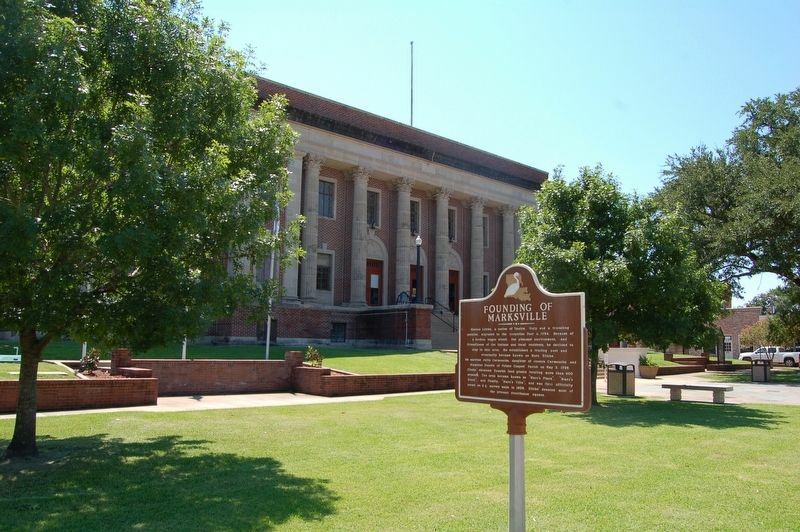 Marker is at or near this postal address: 312 N Main Street, Marksville LA 71351, United States of America. Touch for directions. Other nearby markers. At least 8 other markers are within walking distance of this marker. Solomon Northup, "Twelve Years a Slave" (here, next to this marker); Laborde Building (a few steps from this marker); The First Bowie Knife (within shouting distance of this marker); Bailey Theater (within shouting distance of this marker); Louisiana's Atchafalaya Basin (within shouting distance of this marker); Fort De Russy (within shouting distance of this marker); J. Horace Ducote Law Office (within shouting distance of this marker); Mayer Hotel Site (within shouting distance of this marker). Touch for a list and map of all markers in Marksville. More. 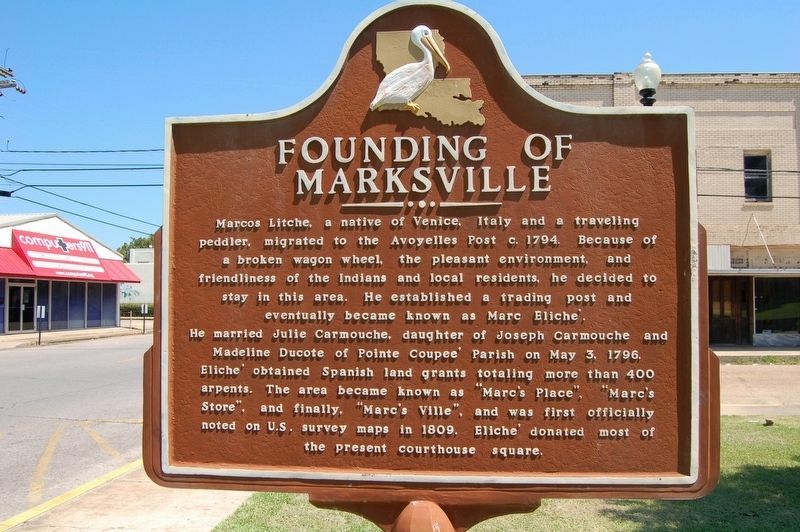 Search the internet for Founding Of Marksville. Credits. This page was last revised on October 25, 2016. This page originally submitted on October 24, 2016. This page has been viewed 241 times since then and 8 times this year. Photos: 1, 2. submitted on October 24, 2016. • Bernard Fisher was the editor who published this page.